The Yaesu FTA-310 is a professional grade hand-held transceiver providing communication (transmit and receive) capability on the International Aircraft Communication Band ("COM" band: 118 ~ 136.975 MHz), and it additionally provides VOR and CDI navigation features on the "NAV" band (108 ~ 117.975 MHz). The FTA-310 boasts 700 mW of clean audio output from its 1.4" (36-mm) diameter loudspeaker, and it also provides 8.33 kHz synthesizer steps for operating on the new narrow-band channel plan. The FTA-310 includes both temperature and supply voltage displays with our exclusive Omni-GlowTM display back-lighting for minimal degradation of your night vision, NOAA weather band monitoring, 8-character Alpha/Numeric Display, 150 Memory Channels, and up to 100 "Book Memory" Channels. The channel configurations can be easily programmed in minutes using the optional PC Programming Kit and your PC. The FTA-310 comes packaged with: BNC Helical Antenna (YHA-73), 110V AC charger with desktop charging cradle (PA-48B, and CD-28, NiMH battery (FNB-83), headset adapter (CT-96), Alkaline battery tray (FBA-25A), and our exclusive 12V DC charging sleeve (CD-59). Re-engineered with a standardized BNC connection the FTA-310 will now allow a quick easy connection to an external antenna giving the user greater transmit and receive range and clarity. The FTA-310 comes value packaged with the CD-59 charging sleeve. The CD-59 gives the operator the freedom to keep the radio powered on continuosly while it is connected to a 12VDC source. The slim form fitting design allows for easy radio operation. 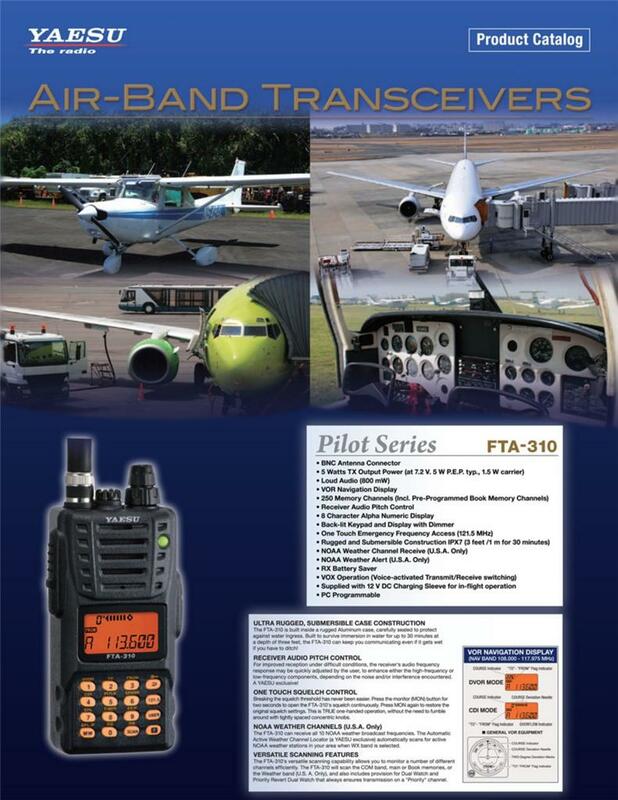 150 memory channels can be easily programmed into the FTA-310 allowing quick easy access to frequently used channels on the aviation band. Additionally, 100 "book memory" channels can be programmed into the unit using the optional PC programming software and cable. All memory channels can be labeled with either a channel number assignment, operating frequency display, or an alpha-numeric channel name display. Audio Pitch Control "A Yaesu Exclusive"
To enhance the audio reception under varying situations the FTA-310 gives the user the option to adjust the pitch on the audio to a higher or lower pitch depending on the noise conditions. This feature greatly improves radio performance in noisy environments. The FTA-310 can receive all 10 NOAA weather broadcast frequencies. The Automatic Active Weather Channel Locator (a Yaesu exclusive) automatically scans for active NOAA weather stations in your area when WX band is selected. The FTA-310 includes a special feature that sounds an alarm when the special "Severe Weather" alert tone is received from a weather broadcast station. This can warn you of potentially hazardous flying conditions. The FTA-310 was engineered for safety and durability. The radio is built around a solid die cast aluminum chassis with heavy duty gasketing throughout, allowing the radio to be submerged up to 3' for 30 minutes (JIS7 waterproofing standard) making this the most durable aviation transciever on the market today.